2014 will be the 20th year of displaced St. Patrick’s Day festivities, and the University Archives blog is marking the occasion by reviewing the official origins of an unofficial celebration. found in RS 41/8/801, March 8, 1995, p. 24. 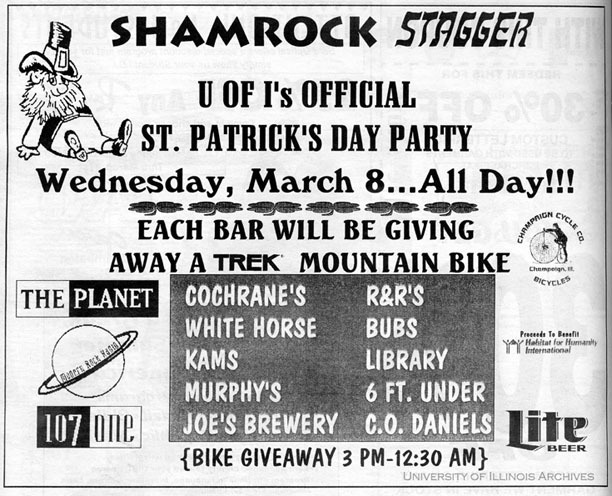 The sharp-eyed reader will note that the “Shamrock Stagger” was advertised as “U of I’s OFFICIAL St. Patrick’s Day Party” (emphasis ours). Presumably, University administrators were not pleased with their implied sponsorship of an all-day binge drinking event. 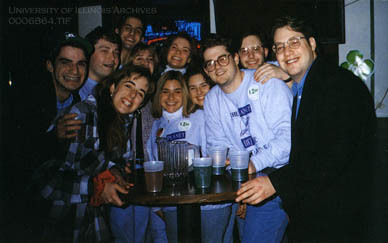 Although no record of correspondence (official or unofficial) between the University and the event’s sponsors has yet been discovered in the University Archives, some changes may have been suggested by concerned parties, because the following year’s pre-Spring Break promotion was smaller and advertised slightly differently. Drink specials on the Wednesday before Spring Break 1996 at Cochrane Enterprise-owned bars were advertised under the banner of “Unofficial St. Patrick’s Day” for the first time (or in some places, “Official Unofficial St. Patrick’s Day”).7 In 1997, Cochrane establishments advertised “Unofficial St. Patrick’s Day 3”, to be held on the Friday eight days before Spring Break, rather than just two days before.8 Subsequent Unofficial events have continued to be held a full week or more before Spring Break. In its evolution from happy hour promotion to informal festival, Unofficial St. Patrick’s Day has accumulated a short but compelling history, and quite a bit of documentation. The Archives encourages you to visit our reading room in 19 Library or explore the sources cited in the endnotes below to further develop your official Unofficial knowledge. 4. “Shamrock Stagger” (advertisement), The Daily Illini, March 8, 1995, p. 24. 5. “C.O. Daniel’s Pre-Break Extravaganza” (advertisement), The Daily Illini, March 14, 1990, p.9. 7. “St. 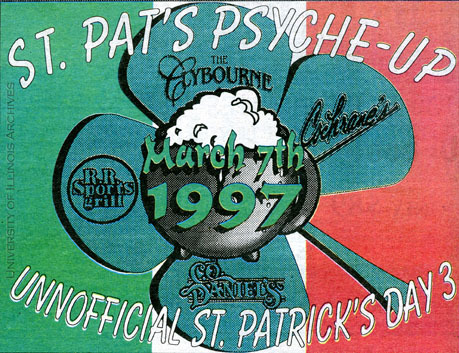 Patrick’s Day” (advertisement), The Daily Illini, March 6, 1996. 8. “St. Pat’s Psyche-Up” (advertisement), The Daily Illini, March 6, 1997, Diversions p. 20. 9. Kate Levine, “University Ready for Unofficial,” The Daily Illini, March 2, 2006, 5A. 10. Report of the Chancellor’s Task Force to Review “Unofficial St. Patrick’s Day” and Other Alcohol-Related Events, January 2007, RS 41/1/6, Dean of Students Subject File, Box 172, “Task Group – Unofficial St. Patrick’s Day 2006-2007”, University of Illinois Archives.